A thermostat is a component of a control system which senses the temperature of a system so that the it’s temperature is maintained near a desired set-point. The thermostat does this by switching heating or cooling devices on or off, or regulating the flow of a heat transfer fluid as needed, to maintain the correct temperature. Is There Only One Kind of Thermostat? Thermostats, especially good ones, can be sensitive. Placing them near the vents of your HVAC system can confuse them. Having a thermostat near the zone it is intended to control can also cause it to “short cycle.” This might be a little bothersome with your air starting and stopping, and it could also limit the effectiveness and life of your thermostat. The best location for a thermostat in a single zone system will likely be an open hallway near the intended control zone. This allows the thermostat access to the airflow of the area, but does not overload the system with too much temperature information. If you have multiple zones you would like to control, it is best to provide each zone with its own thermostat. This will allow you to keep down energy usage in unused areas, and could also save you a good amount of money on bills. We get excited about thermostats here at Max Mechanical because the technology has changed a bit recently and your options are greater than ever before. Your smart phone can now control and monitor your homes air conditioning and heating unit from around the globe with some of today’s newest thermostats. Touch screens, thermostats that you can insert your own background image, ones that send you an alert, or even let us diagnose any problems remotely are just some of the advances in thermostat technology recently. 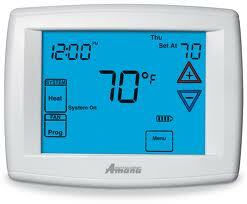 We service and install all major brands of thermostats, from the simple to the high tech. Contact us now for more info.